it you can admire spectacular scenery and meet the rarámuri culture, one of the oldest and best preserved in Mexico. 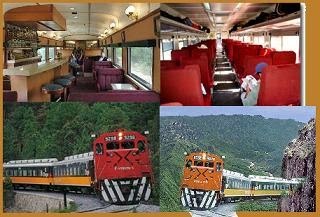 This train covers a distance of 652 kilometers twice a day, passing through the Sierra Tarahumara and stopping at nine major tourist attractions in Barrancas del Cobre. You can board the Chepe at six o'clock every day of the year. Your trip begins in the city of Chihuahua; here the train takes you to the brewery, home to the world's largest Mennonite community. Then continues to Creel, a Magic Town and the main town in the Sierra Tarahumara. The next stop is Divisadero, where you have spectacular views of the Copper Canyon, four times larger than the Grand Canyon. Here you will also find important Tarahumara communities, regional food and crafts. Later, Bauichivo / Cerocahui station is the starting point to visit the Urique Canyon (the largest along the route). Approximately 45 minutes later, the village of Cerocahui awaits your visit with his Jesuit mission and valleys. Just before reaching the state of Sinaloa, Témoris station is the last stop in the state of Chihuahua. This is an excellent place to see waterfalls, gorges, bridges and tunnels. Once in Sinaloa the train will take you to The Fort, a magical town with attractive colonial buildings and a beautiful river. Finally, El Chepe up to Los Mochis, an urban center where you can taste delicious seafood. A trip along the El Chepe'll enjoy comfortable seating, a dining area with full service and fast food, bar, air conditioning, heating and composting toilets.